A Natural Horsemanship Communication Flag in Bright Orange or Green. Horsemanship Flags have been used for years by many top horsemanship professionals such as Tom Dorrance, Buck Brannaman and Ray Hunt. The shaft is composed of a composite fiberglass with a multi-layer epoxy coating. It is highly durable and weather resistant. Weight: 100g. 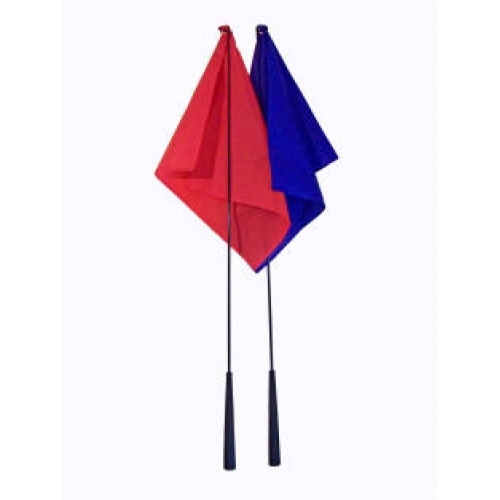 The Communication Flag is ideal for various applications during natural horsemanship / parelli training. Helping bring a natural balance back to horse and pony and is incredibly lightweight and well balanced. At 1.2m, the shaft is long enough to expose your horse to the movement and feel of the flag from a safe distance. The handles are made from top quality high density foam for a comfortable grip which will not be compromised by sweat or rain. Shaft and handles are offered in black only. The flag material is composed of a poly coated, rip-stop nylon secured to the shaft with a reinforced grommet and measures 450mm x 500mm. Natural Horsemanship Flag - Made from the Finest Quality Materials but Affordable!